A top nuclear scientist once tipped to become prime minister in the new Iraqi cabinet has said that he will not take the job, or any other government post. Hussein Shahristani, 62, a Shia Muslim jailed under Saddam Hussein, had been seen as an ideal head of government. But Mr Shahristani said he would rather "serve his country in other ways". UN special envoy Lakhdar Brahimi is choosing an interim Iraqi government in consultation with US presidential envoy Robert Blackwill. Senior US officials were quoted on Wednesday as saying Mr Shahristani was the leading candidate. 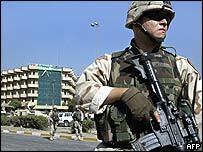 The government will take power after the official 30 June return of sovereignty to Baghdad. Mr Brahimi quashed press speculation that the new government line-up had been finalised, though he said he wanted to reach his conclusions "very soon". 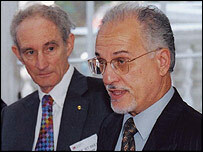 Despite expressing great reluctance, Mr Shahristani had earlier indicated he would accept the post as prime minister. But in a news conference on Thursday he confirmed a statement from Mr Brahimi's spokesman Ahmed Fawzi that he would not be prime minister, and ruled out any other ministerial post. "I have decided to decline the nomination for any government post and prepare to serve the Iraqi people in other activities," he said. Washington had said it was looking for a Shia Muslim who was not too close to any faction or party, but also not so much of a technocrat that he had no political standing. Spokesman Ahmed Fawzi's statement also said Mr Brahimi had "not yet finalised his recommendations on any positions in the new Iraqi government, contrary to speculation otherwise". Mr Brahimi has set himself an end-of-May deadline to get an agreement with Iraqis on the final shape of the government. "Progress is being made, however, and [Mr Brahimi] remains of the view that it needs to be - and can be - brought to closure very soon, so that the new government will have sufficient time to prepare to assume power and engage in meaningful consultations on the forthcoming [UN] Security Council resolution," the statement said. Adnan Pachachi, a Sunni who was foreign minister in the 1960s, is expected to be appointed the next president, according to a US official. Also under consideration are potential candidates for the position of vice president in the new government. Leading names include Ibrahim Jaafari, a doctor from the Shia Dawa Party, and Kurdish leader Jalal Talabani.